We all know that ancestral tombs can be scary, but the tomb of your own family? Visit the Rangirth Ancestral Tomb to answer Uneleas' question. Leave the offerings that Uneleas brought. Find a note and explore the tomb further. Return a family heirloom to Uneleas. On the road south of Ranyon-ruhn, well past Dadrunibi, you will encounter the Dunmer herder Uneleas Rangirth. He came to place offerings on the grave of his father, which lies in his family tomb just to the west. His friend Alvar Omothan came with him and went into the tomb alone but over two hours later, still hasn't come out again. Uneleas tells you that his only skill lies in the bow and that he is too afraid to face the tomb's guardians with it. He begs you to go in his stead. Inside the tomb is a skeleton standing over the body of Alvar Omothan; his broken sword lying beneath him. The offerings he was to place are still on his body, and nearby is a note that he evidently dropped during the fight that suggests he had more than one reason for coming with Uneleas. 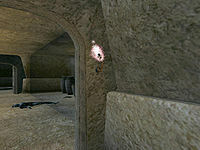 Alvar was in the pay of Azariah Thelas, who believes a ring called the Ring of Rising Fortunes is present in the tomb. Return to Uneleas with the two bits of news. Firstly, he will ask you to place the offerings on the ash-pit containing the remains of his father. Secondly, he is worried that the Telvanni will not respect the sanctity of his family's tomb while they believe the ring to be present. Although he doubts the ring is there, he asks you to search the tomb to make sure. The offering is easily made by activating the ash-pit to the left of the entrance to the tomb. The three offerings, a black rose, some noble sedge flowers and a topaz, are removed from your inventory and appear on the edge of the pit. You can return to Uneleas for a reward of 50 gold. There are two containers in the tomb but neither of those hold the ring, and it doesn't appear to be present anywhere in the tomb. There is, however, one oddity. There are six torches in sconces on the walls of the tomb but the one in the room to the right of the entrance looks... odd. Activate it, and a wall at the back of the tomb slides aside to reveal a hidden chamber. The new room contains a locked, trapped chest, and two skeletons at rest on altars. Inside the chest is a small amount of treasure and the Ring of Rising Fortunes - Azariah Thelas was right after all. Unfortunately, opening the chest causes the two skeletons to animate and attack you. Once the skeletons are dead you have a choice: return the ring to Uneleas or take it to Azariah. In return for the ring, Uneleas will train you in marksmanship, adding two points to your skill. If you tell him you are going to keep the ring, however, he will attack you. If you take the ring to Azariah instead, he will pay you the reward he had originally promised to Alvar: 500 gold. If you tell Uneleas to enter the tomb before killing the guardians, he will head off to the west. You will discover his body should you enter the tomb later. You must leave the offerings by activating the pit; simply dropping them will not cause your journal to update. 1 While exploring a small room within the Rangirth Ancestral Tomb, I found a sconce on the wall that was off a bit relative to the other sconces. When I pushed it, however, I heard the sound of stone moving somewhere else in the tomb. It is possible that I have found some sort of switch. I should look into this tomb further. 2 I found a hidden chamber within the Rangirth Ancestral Tomb. There is a chest within that holds some gold and gems, as well as an enchanted ring. 3 Alvar Omothan, a dead adventurer in the Rangirth Ancestral Tomb, apparently dropped a note on the floor after he died. Its contents tell me a lot about how and why Alvar came here, and what he was looking for. According to the note, someone named Azariah Thelas is looking for an enchanted ring, which he believes is hidden somewhere in this tomb. Alvar never found the ring. 4 Finishes quest I met Uneleas Rangirth on the road between Ranyon-Ruhn and Helnim. He wanted me to check on his tomb, but I didn't have the time to help him. 6 I met Uneleas Rangirth on the road between Ranyon-ruhn and Helnim. He's waiting for his friend Alvar Omothan to finish placing offerings in Uneleas's family tomb. His friend has taken longer than he should have in there, and now he wants me to find out what is taking him so long. I asked him, though, why he hadn't checked on his friend himself, and his answer, basically, is that he can't fight in a tomb. He seems rather cowardly to me. 7 I convinced Uneleas that if he wants to know how his friend is doing, he'd better find out for himself. He was clearly afraid for his life, but he did walk towards his family tomb. 8 I agreed to look in the Rangirth Ancestral Tomb to find out what happened to Uneleas Rangirth's friend. I fear he has come to a bad end. 10 Alvar Omothan, Uneleas Rangirth's friend, seems to have died soon after entering the tomb. His silver longsword lies broken before him. 11 An adventurer lies dead on the floor of the Rangirth Ancestral Tomb. One of the tomb's guardians has killed him. 13 Finishes quest Uneleas Rangirth lies dead on the floor of his own tomb, slain by his own ancestral guardians. A most unfortunate end, for him and his friend Alvar. 15 Uneleas clearly had suspected that Alvar was dead. He knew Alvar's sword was already on the verge of breaking, after noticing a large crack running along the hilt, but Alvar wanted to get to the tomb as quickly as possible. Uneleas doesn't know why he was in such a hurry. 20 Despite his friend Alvar's death as a result of his request, Uneleas Rangirth still wants to finish what he came here to do. I should take the offerings that Alvar was going to leave and place them at the ash pit to the left of the Rangirth Ancestral Tomb's entrance. 25 Finishes quest Uneleas Rangirth asked me to place the offerings that Alvar was carrying in their proper place in the tomb, but I declined. Alvar is dead because of Uneleas' request, and the offerings are already in the tomb. Enough has been done for Uneleas's ancestors. After a moment of consideration, Uneleas agreed on that point. 28 I placed the three offerings at the ash pit in the Rangirth Ancestral Tomb just as Uneleas Rangirth wanted them. 30 Finishes quest After helping Uneleas Rangirth place his long-overdue offerings at his family's tomb, he gave me the fifty septims that he was going to pay Alvar with. 50 I showed the note I found near Alvar's body to Uneleas Rangirth. Uneleas had no idea that Alvar was using him to rob his family tomb, but was even more surprised by the notion that there is a secret chamber within his family's tomb. He claims that the secret chamber doesn't exist, nor the ring that Azariah Thelas seeks. However, he did hear a story once to which Azariah Thelas might be referring. Uneleas is willing to tell me a bit about that story. 60 After summarizing the ring's story, Uneleas reinforced his position that Dilave's ring, the Ring of Rising Fortunes, probably is not in the Rangirth Ancestral Tomb. However, he fears that the Telvanni will not respect the tomb's sanctity as long as they think the ring is still there. To protect his family tomb from desecration, Uneleas will wait for me to search the tomb, and will see if I can find the ring. 70 I told Uneleas Rangirth that he was right... that the Ring of Rising Fortunes is not in the Rangirth Ancestral Tomb. 85 Finishes quest I found the Ring of Rising Fortunes, but why should I give it to a dirt-poor herder and a coward? After I told Uneleas that the ring was now mine, he got a sudden burst of courage and attacked me! 90 Finishes quest I decided to finish Alvar Omothan's task, and after finding the Ring of Rising Fortunes inside a secret chamber, I delivered the ring to Azariah Thelas. He was disappointed in Alvar's incompetence and untimely end, but was glad that I finished his task. I received the reward that Azariah had promised Alvar: five hundred septims, plus any other treasure I found within the Rangirth Ancestral Tomb. 100 Finishes quest I found the Ring of Rising Fortunes and gave it to Uneleas Rangirth. He promised that he would protect the ring from the Telvanni, and as a reward, he agreed to teach me some pointers on marksmanship, which he had learned while protecting his herd from predators at night. This page was last modified on 16 March 2019, at 23:37.